On the 19th of July, on the way home from running some errands, I decided to drive through this new neighborhood that was just built behind my own neighborhood. The new homes were built on what used to be a large, open field that sloped down from Chambers Road down to Parker Road. I used to head out there to try and photograph the prairie dogs on occasion in the past, and also did some of my earliest lightning photography out there on several occasions. Some of my early moon photography was done out there as well. I was kind of bummed when I saw they had started construction on a whole new neighborhood. When I drove onto the new road, I was surprised to find it ended, rather quickly, in a cul-de-sac. The lot plans had shown homes built on the entire open field, from Chambers right down to Parker. It seems plans changed, and instead of the whole entire field being plowed under and built on, most of it remained. Down below the cul-de-sac, a large swath of purple summer flowers of a few varieties, with a few sunflowers, large white flowers, and a handful of other colors including red, orange, and these very light yellow flowers, were scattered about. The largest group of flowers, by far, were the thistles. I’d never seen these thistles before…sometime during the least year and a half, something must have seeded them. Some of the largest and most overgrown thistles I’ve ever seen…almost bushes, some of them must have spanned five-foot diameters with multiple stalks, all spoked out around GIANT central stalks. 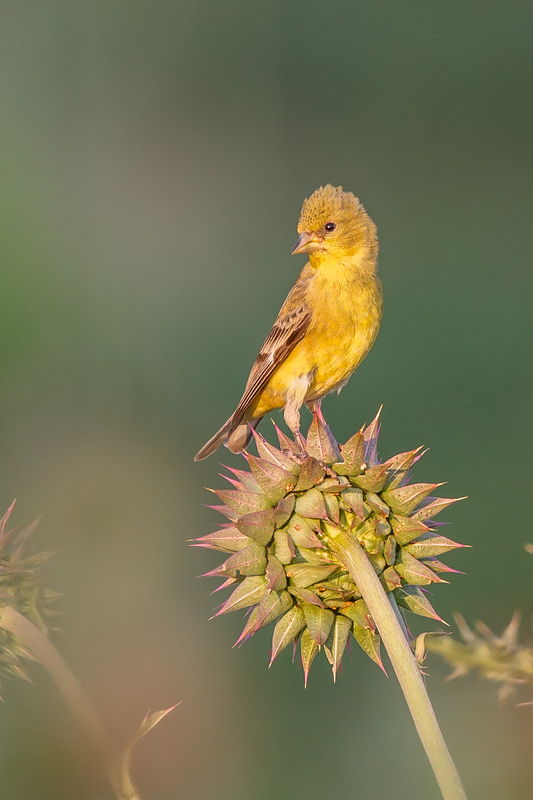 Well, where there are thistles, there are finches. 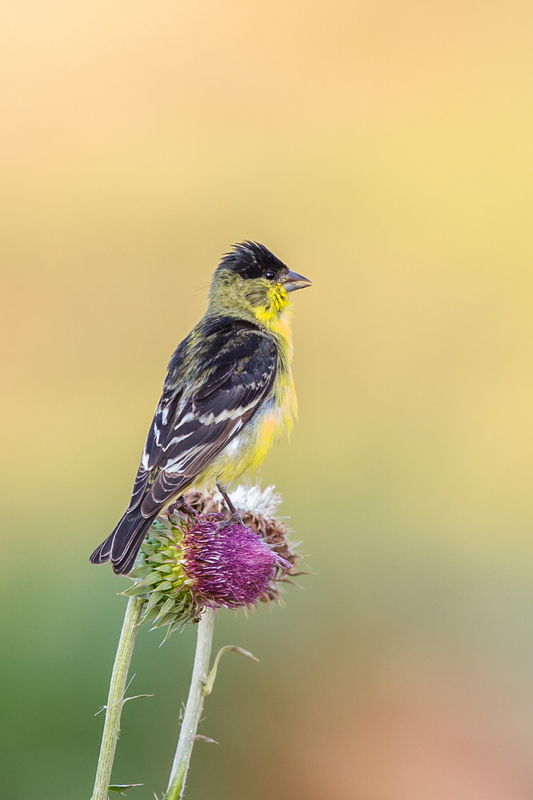 Finches LOVE nyjer seed, which is thistle seed. I’d first noticed a large group of finches of unknown varieties lining the outer edge of the roofs of the last two houses in the new development. Then I heard their songs, and I knew there were Goldfinch among them. I love goldfinch, I can hear them singing around my house, but they rarely visit my yard, and even when I have nyjer seed in my feeders, they only ever seem to visit the feeders themselves, and never perch for long on anything that lends itself to artistic bird photography. So, I had to take advantage of my discovery of this wonderful field full of thistles and golden birds. I dashed home, grabbed my gear, headed out through Shalome Park, which has an internal road that runs right along the old field, and they don’t have any fences there. After first heading out towards the thistle patch, the bulk of the birds took off back to the roofs eves, however after about a half hour of patience, they all started flitting back down again. It was a Finchfest! Dozens of them, if not hundreds, all shredding their way through the thistles. The newly blooming thistles were safe, but the old, browned ones were prime targets. Ripped and shredded to pieces, the birds guzzled down thousands of seeds. Intriguingly, you could tell they were helping to seed the next generation of thistle at the same time…for every seed eaten, two or more drifted off in the wind in the mad frenzy of the birds in their hunt for food. There ended up being American Goldfinch, Lesser Goldfinch, the ever-present House Finch, as well as some sparrows, a Black-Chinned Hummingbird, and what I believe was a Buff-Breasted Flycatcher. It’s rare that I’m able to get birds to pose so well in a purely natural setting, such photos usually require careful setups and preparation to attract birds and get them to perch properly on interesting perches. 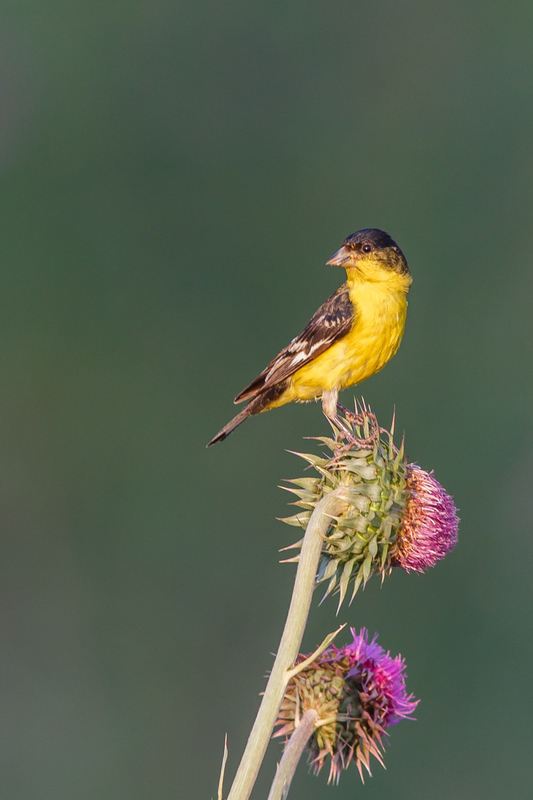 In this case, the birds put on a show entirely on their own…with the thistle as the natural setup. Thanks, everyone! I’m glad you like the shots. Una Serie Impresionante, Realmente Es Muy Bueno El Nivel De Detalle, Me Gusta Mucho… Un Saludo. The lighting is beautiful. Ain’t serendipity grand!? Awesome. Beautiful pictures. What gear did you use? I want to learn….. Thanks, Jan. As far as equipment, I used a Canon 5D III, the Canon EF 600mm f/4 L Mark II lens, and a Gitzo GT3532LS with Jobu Pro 2 gimbal head. The lens is a hell of a lens. The lighting was really bad that day, patchy clouds which kept the lighting changing constantly, so highlights are a bit hot in some of the shots…but otherwise, the 5D III and 600/4 are a fantastic combination. Wonderful shots. The birds were cooperative and you got some gorgeous poses. Wow!